Having a commercial metal roof restoration project performed on your metal roof will extend its lifespan greatly. A full roof replacement is much more costly, even though a restoration project is a major repair event. Before paying big dollars for a full metal roof replacement, let our professionally trained restoration team find your roof’s weaknesses and fix them. This is our specialty at Taurus Elite Commercial Roof Systems and it will save you as much as 50% over what you would pay for a replacement. You need a commercial roofing contractor that has the expertise and experience to carry out this type of project. As we’ve pointed out, we have mastered this process and are Texas’ leaders in commercial metal roof restoration. Just like any other type of commercial roofing system, metal roofing will get beat up over time by the stress Mother Nature places on them each year. Having your metal roof restored will do many things including: cooling your building’s interior by reflecting heat from the sun, eliminate rusting and eliminate leaks. Building owners and managers choose metal roofing over other types of roofing, mainly because of their long lifespans. It doesn’t mean that metal roofing systems don’t have their own maintenance issues. As we stated earlier, over time, metal roofing is just as affected by extreme weather as other roofing systems. Your metal roof will develop leaks, as will other roofing systems, without a proper maintenance plan in place. Rust will start to form after the roof starts to deteriorate. If you don’t notice the rusting areas and the deterioration until after they begin to leak, its probably too late. Your inspection should focus on several probable culprits – roof penetrations, fasteners, screws, skylights, vents and ridge caps. Since the fasteners are normally exposed, every screw is a potential issue with a commercial metal roof. There’s a rubber washer installed with each screw that should seal out water. But, as time goes by, they will deteriorate and crack, letting moisture into your property through the screws. Another area to pay attention to for moisture penetration is the edges of the metal sheets that are placed on the roof during installation. High winds can force water up and in between these sheets and right into your property. 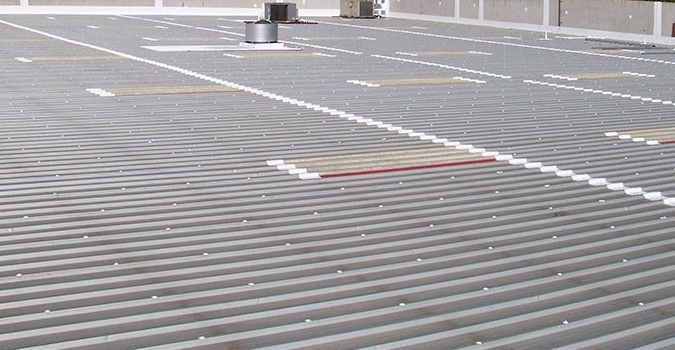 When the roof is initially installed, there is a sealant that is applied in between each metal sheet. But moisture will get into the property when these sealants, just like the washers, break down over time. High winds will also cause problems by lifting up the sheets at the overlapping edges. The locations where the metal sheets are attached to the roof’s trusses with screws or nails are other possible weak spots. However, you’ll be happy to discover that a total replacement of your metal roof is not necessary when it’s showing its age with rust and leaks. Putting your roof through a complete restoration process will solve your problems. The commercial roofing contractor and the particular products you choose for the process will make all the difference in keeping your damage and future expenses mitigated. 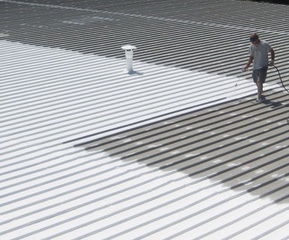 Picking the wrong product , especially the roof coating, when your current roof was initially installed, is probably causing your current problems. Silicone coating materials will hold up better over time than acrylic based products. It won’t fade, degrade, haze or chalk and needs less reinforcement. making it an excellent choice for a metal roof and better than acrylic. They are also better for the environment – they have a longer lifespan and lower VOC. Local quality assurance programs can be checked for Energy Star compliance and approved products. This also would be a great time to upgrade your buildings R value by adding insulation. Your interior will be cooler by using a good silicone spray foam, improving your insulation from the outside. When your contractor suggests the silicone products to use, do some due diligence and compare their individual features, choosing the one that is best for your metal roof. One thing is sure – no metal roof is the same as any other. We are always improving our process and products. We want to make sure we’re delivering the best quality products and highest quality service possible, so we monitor every project closely to maximize adhesion during the process.